Yesterday, Anya Ixchel (Angela Thomas) and Kim Pasternak (me) presented our session at the New Media Consortium’s Symposium on Creativity in Second Life. We used aspects of Process Drama to develop a structure that can be used to explore issues and concerns through roleplay in the virtual world. The basic premise was that we located the story in the future – 2009. This was a time 2 years after several changes had been made to the governance of Second Life communities. Many existing (2007 reality) freedoms in Second Life were restricted or outlawed in the fictional future. Indeed, during the first three to four years of Second Life, citizenship grew to several million users precisely because of the liberties and creativities found in such an “infinite possibilities” standpoint. People entered Second Life for a multiplicity of purposes, and its success today is directly related to the opportunities provided by user created content. 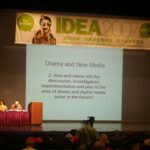 Collaborative creativity on a global scale was never so exciting and exhilarating, and you might even recall that in 2007, the ground-breaking educational innovators at the New Media Consortium held a symposium on creativity in Second Life. But by far we, the undersigned, believe that the most debilitating move on Linden Lab’s part is the new TOS policy issued in January of this year, 2009, to remove all M rated sims and M rated content, even in citizen’s private homes. With 30 million users, all over 18 and adult, we cannot understand this move to reduce Second Life to Disneyland, which serves only to stifle the creativity and personal freedom of expression out of each and very one of us. 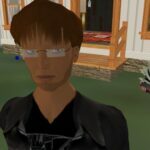 Second Life is no longer a deeply compelling place for us to live, to work, and to do our business. We therefore call for an immediate return to the terms of service as set out at the beginning of 2007. The material requirements for the drama were quite simple –Angela has some good pictures on her discussion of the event and JoKay Wollongong also. We used a mock up TV studio, a couple of sofas, a changeable backdrop screen (with international locations), a poster and a collection of role badges to help identify the general roles played by participants, and a Polling station. The entire drama came and went very quickly – our 50 minute session was barely long enough to contain the interest and buzz that developed. Initial feedback after the session indicated that participants found the process engaging and effective.